Field corn has been grown for thousands of years. This type of corn has been used for many centuries to feed animals and to grind into cornmeal. Sweet corn, the type my boys crave during the summer, has not been around nearly as long. Sweet corn is believed to have been grown by the Iroquois Indiana in the 1770’s. The Iroquois called this corn “papoon”. Its kernels were white and the cob was a bright red color that the Indians used to make red dye. New Englanders soon started growing there own papoon and through cross-pollinating began to make new varieties of sweet corn. Sweet corn very well may have been something that showed up on George Washington’s dinner table. However, given Washington’s very bad teeth and wooden dentures, it is probably not something that he was able to eat himself. Today, there are many different sweet corn varieties. 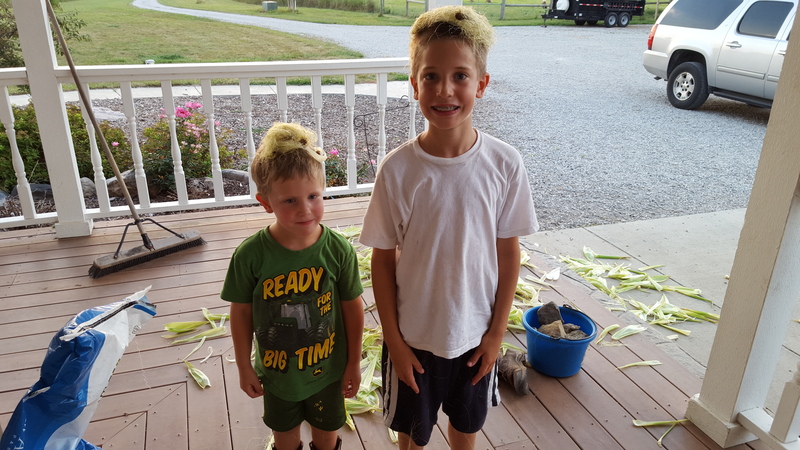 Shucking sweet corn and eating it for dinner is a Stevenson family tradition. Putting the corn silks on your head is optional. If you want to learn more about some corn history, check out “The Story of Corn” by Betty Fussel.